Most people who hear we've been to South Africa are very curious about one thing, but are too shy to ask. So here's the answer to the question on everyone's lips about our time in South Africa. The answer that will, undoubtedly, make those who love South Africa cringe. I was surprised to learn that they're not actually called "The Galapagos Islands". Not technically, anyway. Officially they are designated as El Archipeligo de Colón. They were named in honor of Christopher Columbus (known in Spanish as Cristobal Colón), and each of the individual islands were named after him, his ships, the Spanish monarchs who financed him, and so on. In English, these islands are officially (and appropriately) called the Enchanted Islands, something they were first named by nineteenth-century sailors. These sailors, confounded by the magnetic anomolies and unpredictable ocean currents in the region, reported a mysterious collection of islands that would appear on the horizon, but never get any closer than that. Eventually the islands were all located and identified by these English sailors (mainly pirates and whalers), who of course gave them all English names. When Ecuador took posession of this archipeligo, they stuck with the name El Archipeligo de Colón, but gave most of the individual islands new offical names. Thus it is that today, each island is known by at least two different names, and often by three. Meanwhile, in no language are they officially called the Galapagos Islands: that name dates to the 1960s, and the birth of tourism. People would tell their friends and family that they were off to see "the galapagos", meaning the famous tortoises endemic to the islands. (Galapagos is Spanish for tortoise.) In time, the word was taken to mean the islands as a group, but you won't find it listed on any official map. We departed from San Cristobal Island at mid-day on Tuesday, August 23. 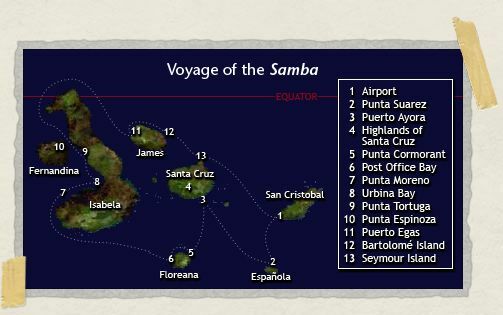 Each day aboard the Samba generally followed the same schedule. We would be woken at 6:30am or so (give or take an hour), and have breakfast together thirty minutes later. After that, we would have a morning excursion, followed by a snack and perhaps some snorkeling. After lunch, we would have an afternoon excursion, again perhaps followed by snorkeling. Dinner was usually at 7pm, and because the boat navigated each night, there would always be something completely new outside in the morning. On our first night aboard the Samba, our guide Mauricio promised that every day would be better than the last, and that every dream we'd ever had about the Galapagos would be exceeded before we were done. He was right. 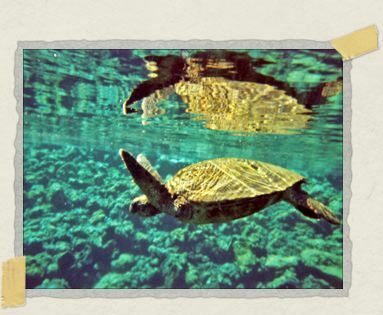 Jessica has already related her favorite memories from Galapagos. 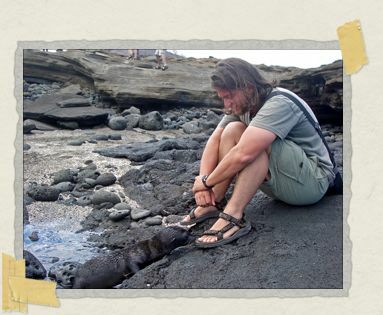 Just for the record, in case you wanted to place those experiences on the map, we sat with the giant tortoise in the Highlands of Santa Cruz. We acutally swam with the sea lions four times: off of Punta Tortuga, Punta Espinoza, Puerto Egas, and Seymour Island. Her story about the sea lion that floated right in front her happened at Punta Espinoza, and we saw the mother sea lion and her two babies off the coast of Seymour Island. The avalanche of dolphins surrounded us on the way from Seymour Island back to San Cristobal. On our third day in the Galapagos, we went snorkeling off of Isabela Island. We all worked our way together along the coastline, which was composed of a razor-sharp black rock called aa ("ah-ah") lava. It was the only time during our eight days in the islands that the three scuba divers (Becky, Andy, and Mauricio) accompanied us as snorkelers. Mauricio, it turned out, had a surprise for us. There were a number of deep tidal pools along the shore, separated from the ocean by the midday low tide. Mauricio made us take off our flippers and clambor over the rock into a connected series of these pools. It was excruciating, but the fish in the pools were amazing. But they weren't the reason we were there. Amazing it was. It was a deep pool, absolutely filled with sea turtles. There were dozens of them: some sleeping on the bottom, others floating gently here and there, and others still that would swim directly up to us. I remember being face to face with those ancient, gentle creatures. I remember having to alter my course to avoid swimming into them. I remember the way they seemed to dance in the clear, cold water. I remember it all perfectly. On our sixth day, we were at James Island (also called Santiago Island), at a place called Puerto Egas. Jessica and I had left the boat with partially full camera cards, convinced that being able to take about four hundred photos between the two of us would be more than enough. We were wrong. James Island was amazing, filled with birds, seal lions, fur seals, marine iguanas, and spectacular vistas of stone and sea in every direction. We took photo after photo, and soon enough we were deleting old photos to make way for new ones. Eventually we came across an adorable scene: Becky was sitting on a flat patch of rock along the shore, and a sea lion pup was clumsily making its way out of the sea and over to her. It snuffled at her toes for a few minutes before returning to the water. As the other moved on, I sat over where Becky had been to see if the baby sea lion would return for me. It did. It waddled over to me curiously, and paused just inches away from my feet. Then it clambored up to my toes, and sniffed them. I remember the way its whiskers tickled my feet, the quick warm puffs of breath on my toes. I remember it all perfectly. Later that same day, we went snorkeling. We were all sitting in the panga (the motorized dingy that took us to and from the Samba) when we arrived at the snorkeling site, none of us eager to be the first to plunge into the chilly water. Eventually, Simon threw himself overboard. 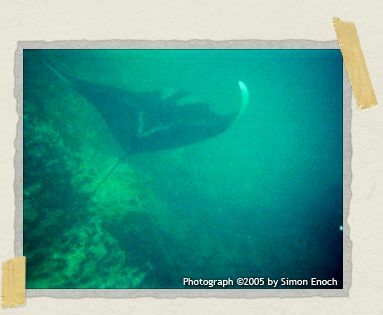 As soon as he resurfaced he started yelling to all of us that there was a huge ray in the water, directly below him. There were probably few things that could have gotten the rest of us into the water so quickly. As soon as Jessica and I got over to where Simon was, we could see it clearly. It was a manta ray, a gentle giant of the deep, something I'd wanted to see with my own eyes since I first saw a picture of one as a small child. Soon enough, the manta vanished into the open sea. I remember watching it swim away, my brow furrowed in amazement, still trying to come to grips with the sheer scale of what was swimming with us in the ocean. I remember it all perfectly. you do, you capture it all perfectly.